Trendy cord pendants in cheerful colours, with large socket (E27 fitting). They are a perfect match with our Swirlamps. The cord pendants have a plastic ceiling cup, a fabric cord covered in woven fabric, and a silicone layered large socket. Silicone cord pendants are extremely trendy and look smart in that one little corner in the room, or together in a group above the table or in the bedroom. The LED lamps are not included, but you can order them separately in our shop. Cord pendants There are 18 products. 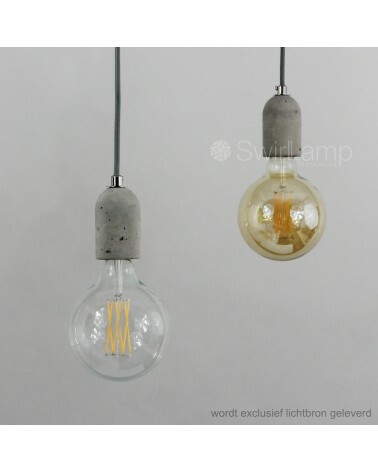 Pendant with grey fabric cord and concrete E27 lamp holder with a diameter of 85mm and a height of 85mm. Grey plastic ceiling cup with hook and plug. Total length of this set from top ceiling cup to bottom lamp holder is 150cm. 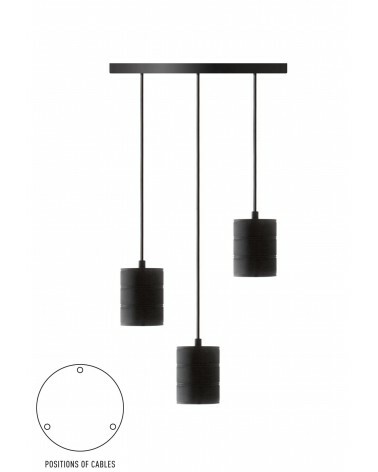 Metal Pendant with black fabric cord and black chrome E27 lamp holder. Black chrome metal ceiling rose with screws and plugs. Total length of this set from top ceiling cup to bottom lamp holder is 150cm. 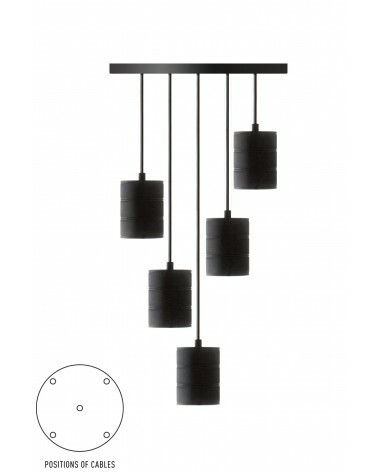 Pendel hanglamp met zwarte kunststof plafond cup, 1.4 meter lang zwart strijkijzer snoer en een zwarte siliconen omhulde E27 fitting (grote fitting). Het snoer is simpel zelf in te korten. Deze hanglamp vormt een perfecte combinatie met een Swirlamp, maar is ook met alleen een LED globelamp een eyecatcher in je interieur! Pendel hanglamp met gele kunststof plafond cup, 1 meter lang geel strijkijzer snoer en een gele siliconen rubber omhulde E27 fitting (grote fitting). Deze pendellamp vormt een perfecte combinatie met een Swirlamp, maar is ook met alleen een LED globelamp een eyecatcher in je interieur! 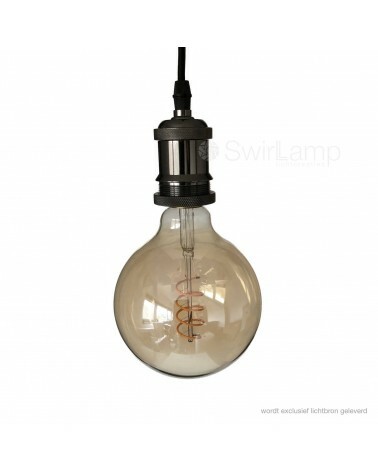 Black industrial cord pendant wit E40 socket, especially and exclusively made for our very large Giant XXL LED bulbs. The 2 meters long cord has a woven fabric cover. 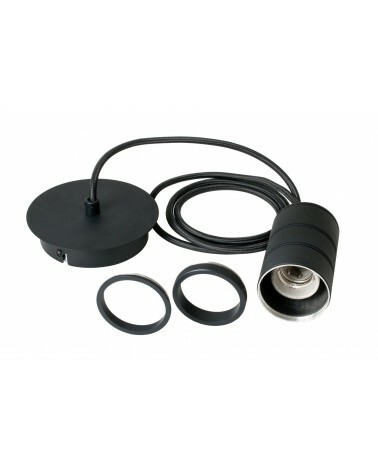 Bronze-coloured cord pendant wit E40 socket, especially and exclusively made for our very large Giant XXL LED bulbs. The 2 meters long cord has a woven fabric cover. If just one Giant XXL LED bulb can already blow you away, how about five of them?! This pendant has room for five Giant XXL LED bulbs which you can playfully adjust at different heights. Every cord is 2 meters long and easily adjustable. Maakt één Giant XXL LED lamp al indruk, helemaal versteld sta je als je deze drievoudige pendel ziet! Hang de Giant XXL LED lampen bijvoorbeeld speels op verschillende hoogtes in een groep van drie stuks bij elkaar. Snoerlengte van elk snoer is 2m, deze zijn eenvoudig in te korten. Let op: dit product heeft mogelijk een langere levertijd (3-6 werkdagen).